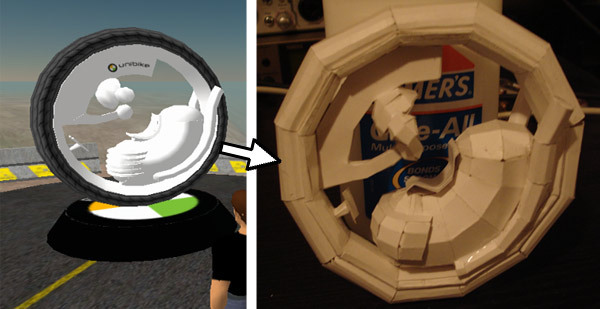 This was a fun little experiment in which I used OGLE to grab an OBJ of an model in Second Life, and then (after some cleanup in Maya) used Pepakura to make a printable pattern that could be assembled into a real-world version. Click here for more images and for links to download the pattern, if you’d like to make your own uni-bike. 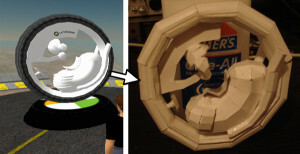 While Second Life offers everything you need to apply complex textures to your objects on a per-face basis, it can be really tricky to determine the appropriate repetitions and offsets to get a specific portion of the texture onto a specific face. I’ve created a tool that sidesteps the issue and allows users to interactively click and drag a selection box around a given portion of a texture. The program then calculates the necessary offset / repetition values to have the selected region appear on a face. To use the program, download the zip file from here. Read the instructions below, or scroll down for a video. 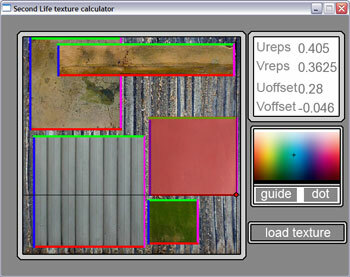 After opening the program, load your texure image (JPG, GIF, BMP, or Targa) by clicking on the “load texture” button. Once you’ve done that, click and drag anywhere in the image to define a rectangular region. As you drag, you’ll see the region you’re selecting highlighted in red. When you let go of the mouse, the program will display the necessary repetition and offset values in the top-right. Using the specified values in SecondLife will give you the selected portion of your texture. If the highlight color isn’t to your liking, click somewhere in the color swatch region to select a color that you would prefer to use (something that will contrast with your texture), and click on the “dot” button. The color of the selection dot will change to the color you selected, and further selections will be in that color. You can also change the color of the horizontal and vertical guide lines to provide better contrast. To do that, select a color from the swatch and click the “guide” button.